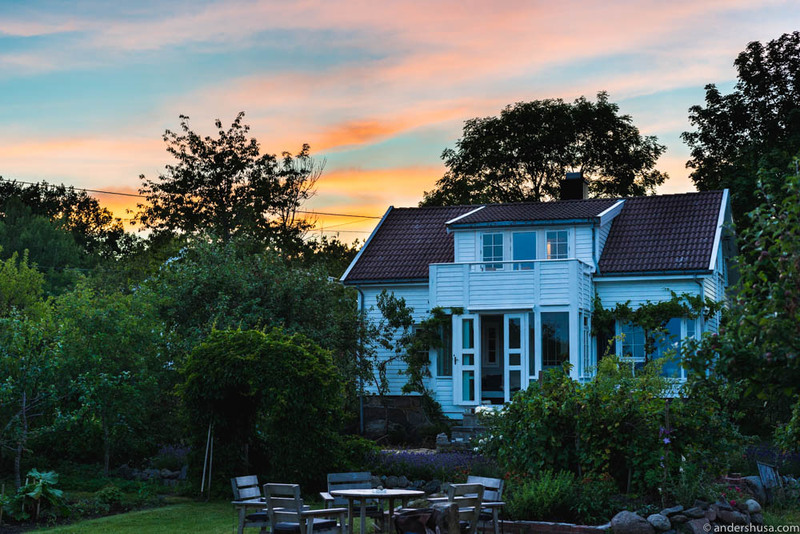 They used to run one of Norway’s best restaurants, Måltid in Kristiansand. 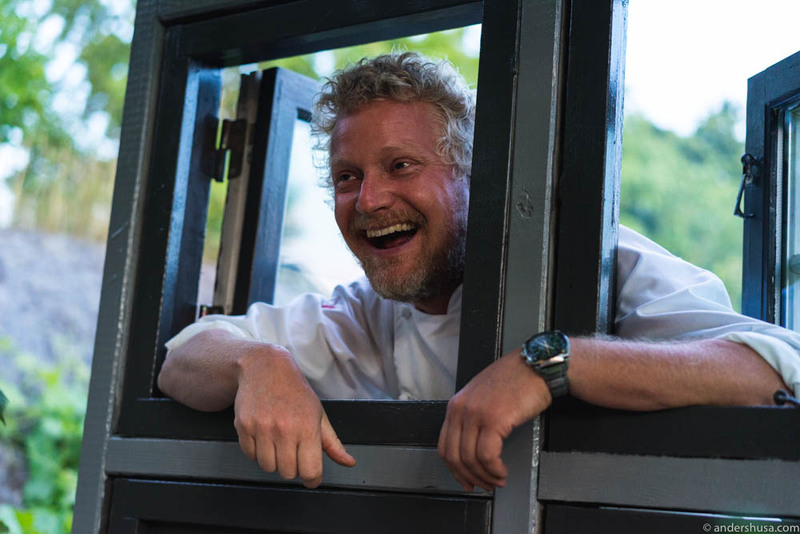 By the time the Michelin Guide acknowledged their tremendous quality in its February 2016 book, ironically, the place had already shut down. 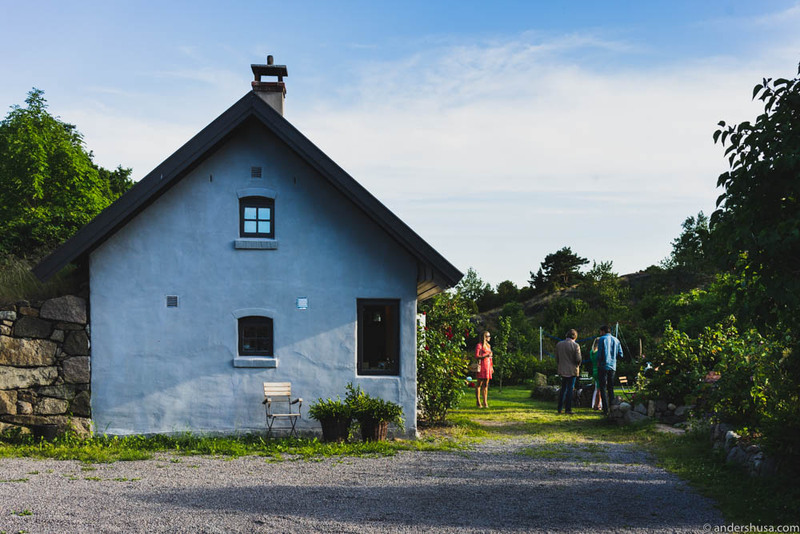 After that adventure, Kim Wiuff and Linn Mjelde returned to a more quiet life, on the peaceful island of Tjøme, where they opened a high-quality grocery store focused on organic produce from local and independent producers – Tjøme Kolonial. 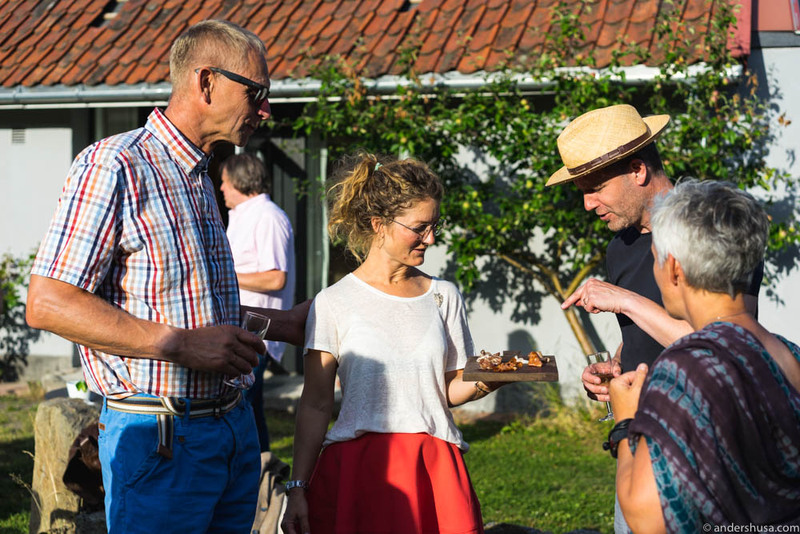 However, every now and then the couple still host food-related events in their neighborhood. 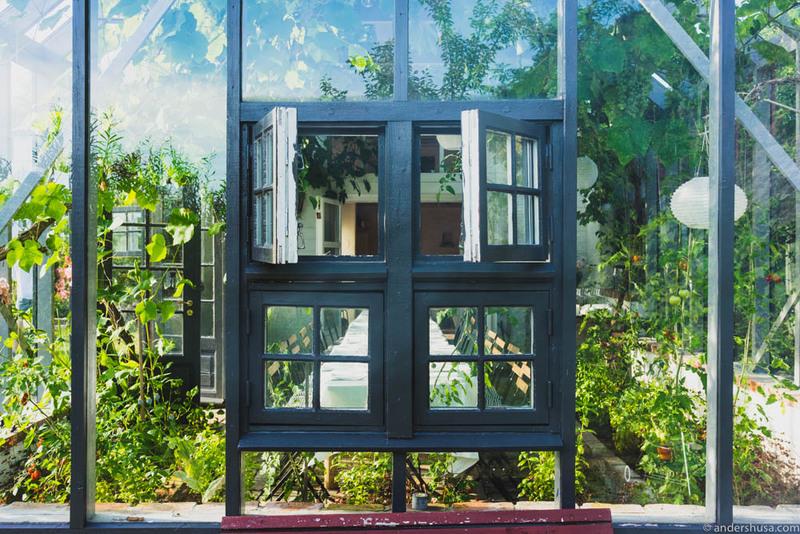 This week, they invited us to join a limited, two-days only, pop-up dinner set in the spectacular Glasshuset på Ødekjære. 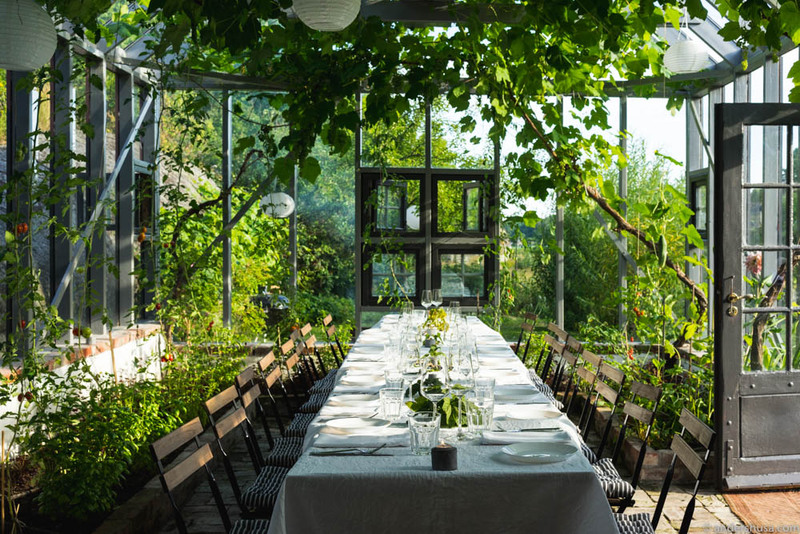 A social dinner in a greenhouse, where 16 strangers met for a five-course meal with wine pairings. Imres Granola is the best granola! We arrived at Tjøme two hours prior to the dinner, because we wanted to check out Kim and Linn’s grocery store. Unfortunately, they had decided to close an hour earlier this day due to preparations for the pop-up. We caught Kim about to lock the door, but were able to convince him to give us a quick tour inside. Tjøme Kolonial is like a miniature Maschmanns Matmarked or Gutta på Haugen, for those who get the Oslo references. Shelves upon shelves, exclusively featuring small-scale producers of some of the best products available on the Norwegian market. Like the granola from Imres Granola (it’s made by one man who is deeply passionate about ecology, granola, and heavy metal music) and the fermented hot sauce Midsummer, which is like Norway’s version of the Tabasco sauce (except this one is actually tasty). To kill off the remaining hour and fifty-five minutes before dinner, we headed to the World’s End. Glasshuset på Ødekjære was designed and built in 2008 by architect Rolf Jacobsen. Him and his wife, Janne, were also among the guests this night. 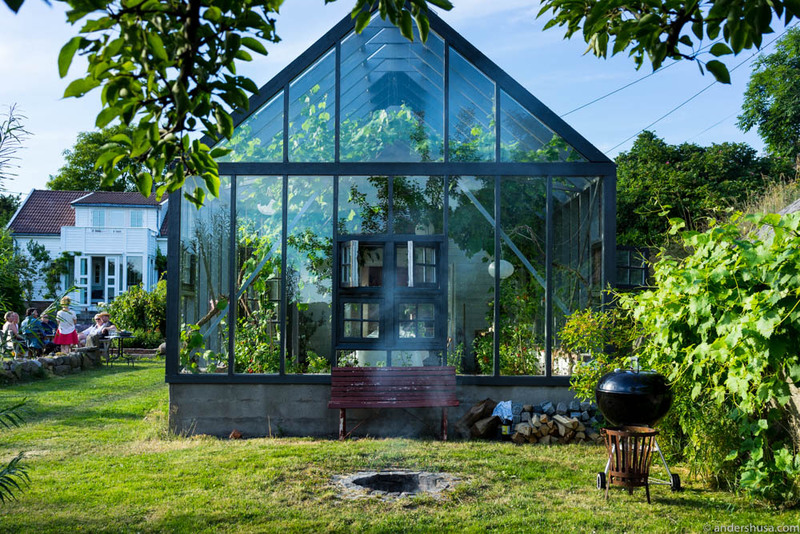 The building is both a house and a greenhouse that meets and merges. It’s like a living room with glass walls, where grapes and tomatoes are hanging from the ceiling. 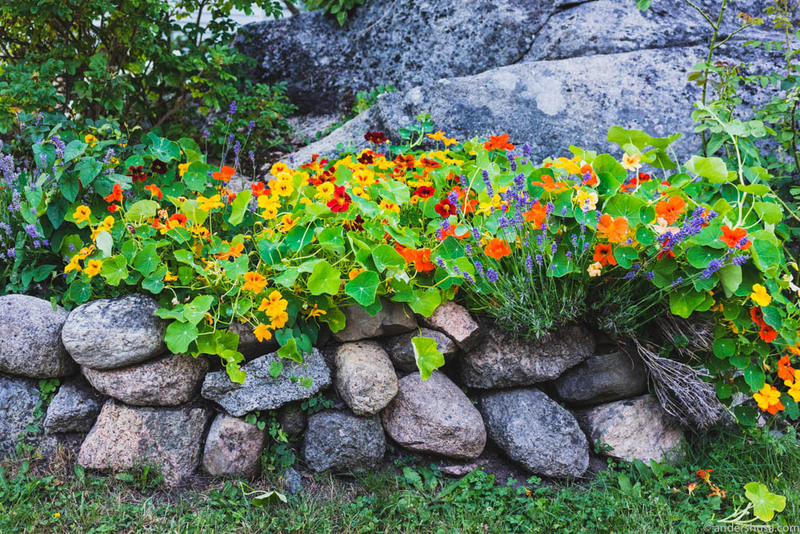 Set in a beautiful surrounding garden, where herbs, flowers, and berries grow, and sheep roam around on the other side of the fence. 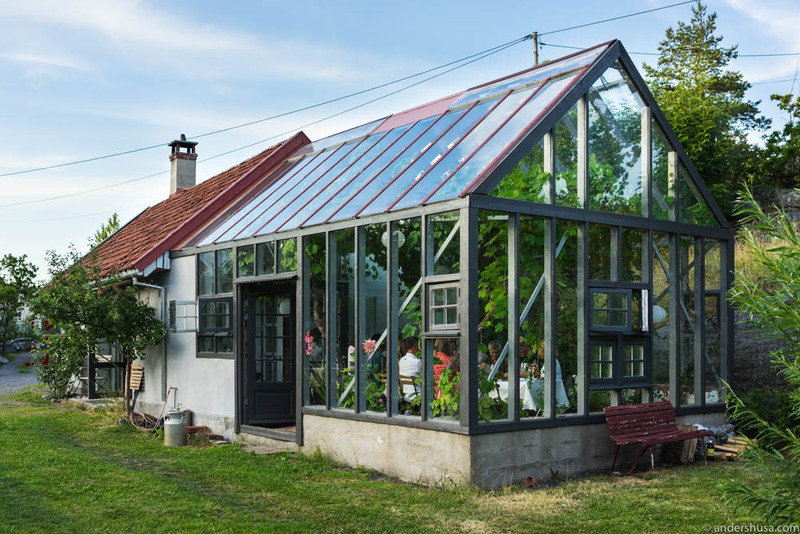 Possibly even more spectacular than the now-closed Stedsans at Østergro – a rooftop garden restaurant set in a greenhouse at Østerbro in Copenhagen. 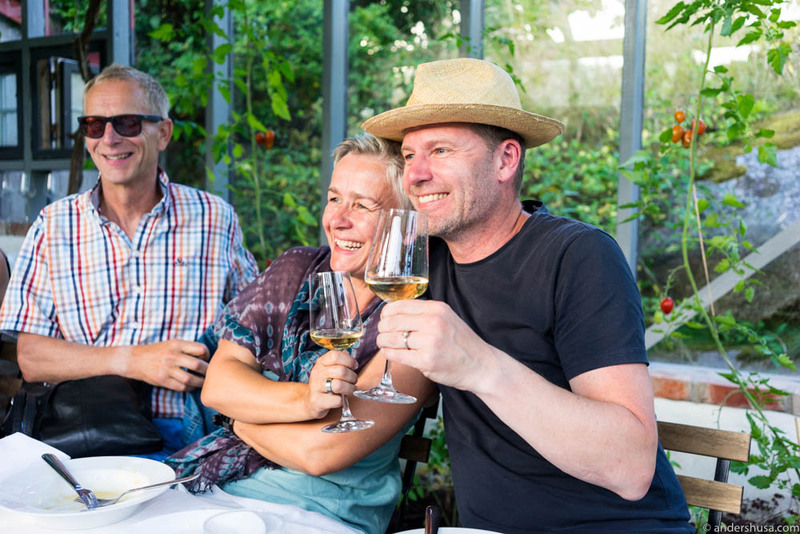 PS: Stedsans may be closed, but Gro Spiseri has picked up the baton, while Mette and Flemming have moved to Sweden to continue their Stedsans project in a forest setting. 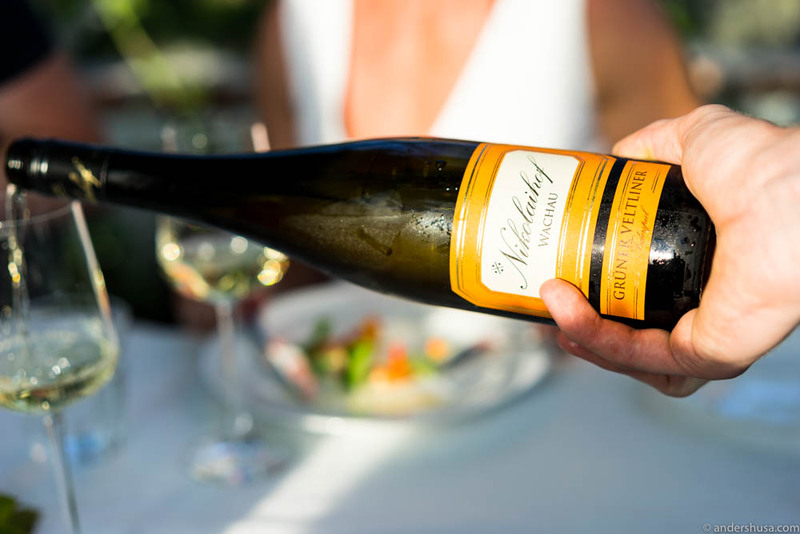 The hostess, Linn, welcomed each guest as they arrived with a glass of Diebolt-Vallois Blanc de Blancs Champagne. She encouraged everyone to greet each other, reminding us that we were all to be seated around the same table very soon. 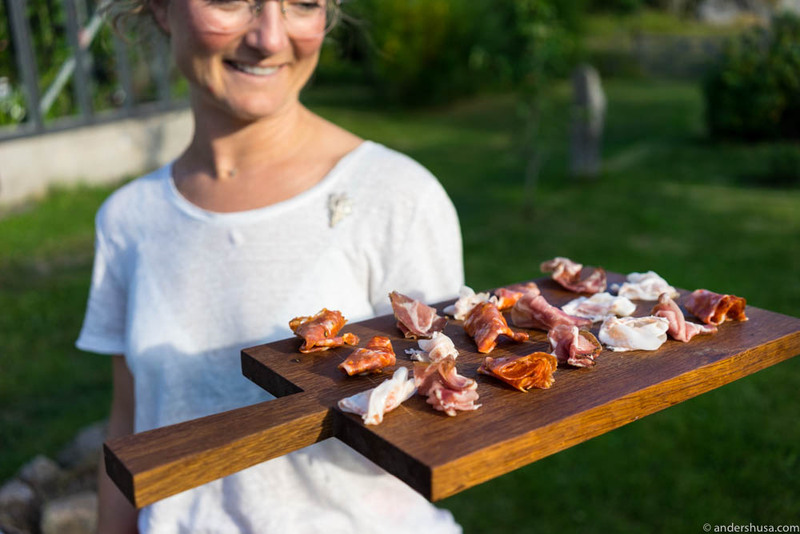 Before long, aperitifs started flowing from the kitchen in a rapid procession. 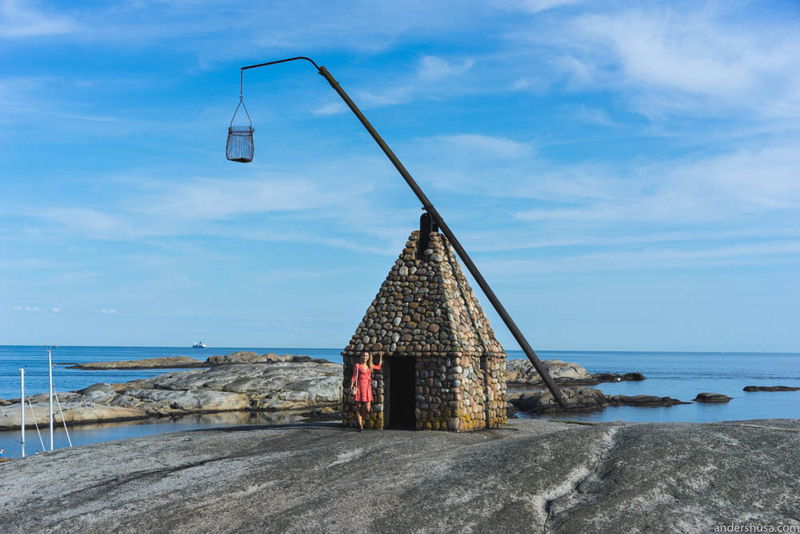 This night, Kim and Linn had good assistance from their previous co-workers at Måltid, experienced sommelier Sigurd Eilerås and the current head waiter at Astral, Per Kristian Stensholt. We got Norwegian charcuterie from producers ASK and Metervare, a turnip covered in bacon fat and crumble served from a flowerpot (inspired by Noma perhaps), local Tjøme potatoes with løyrom, a smoked tartar served on the famous Olof Viktors organic sourdough rye flatbreads, and a brilliant piece of smoked and crispy goose ham with cheery sauce and shavings of frozen foie gras. I can imagine most of these ingredients are available for purchase at Tjøme Kolonial. 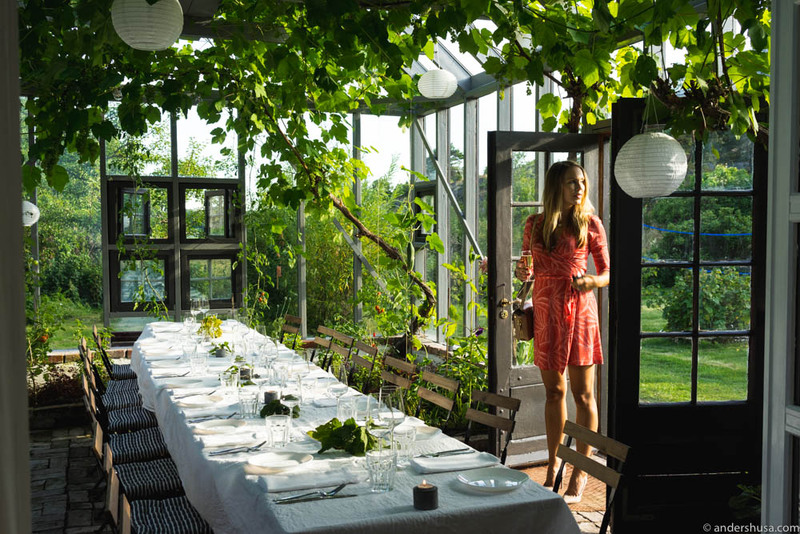 After five tasty nibbles in the garden outside, we gathered inside the greenhouse to enjoy a five-course tasting menu prepared by chef Kim with wine pairings selected by Linn. 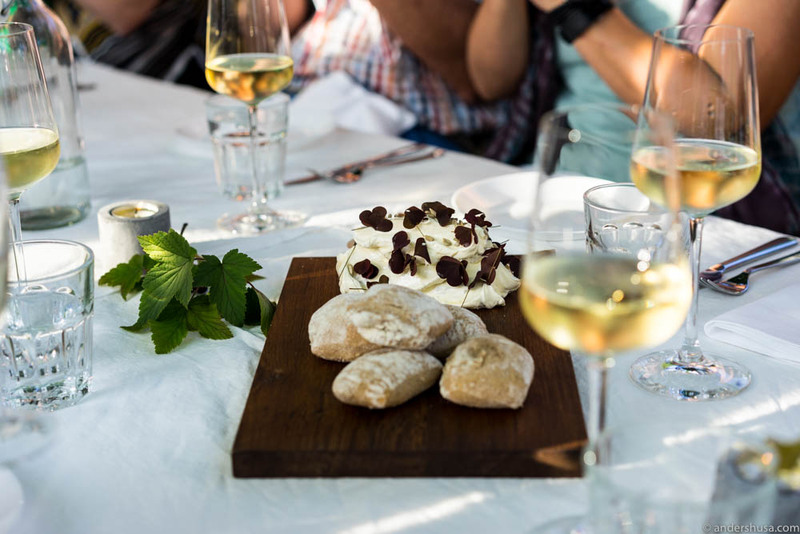 Homemade bread baked with emmer and wheat from Holli Mølle was served with whipped butter mixed with ox fat, sunflowers seeds an oxalis – adding crunch, nuttiness, acidity, and umami flavor to the salty and rich butter. I would be happy eating just that, but the meal hadn’t even started! The first course was a smoked wild salmon caught in the river Lågen. 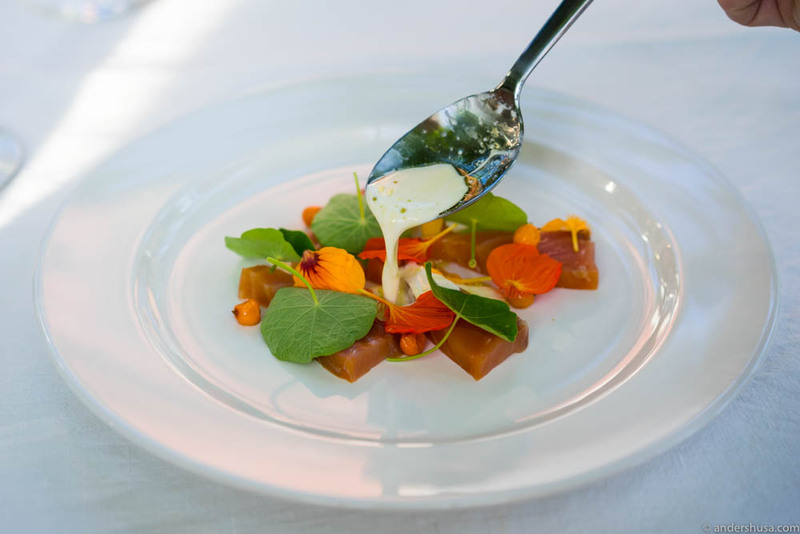 Decorated with nasturtium leaves and flowers from the garden, and served with a horseradish cream with dill oil. However, the combination of a fatty fish and a rich sauce would not work as well without the addition of the sea buckthorn. 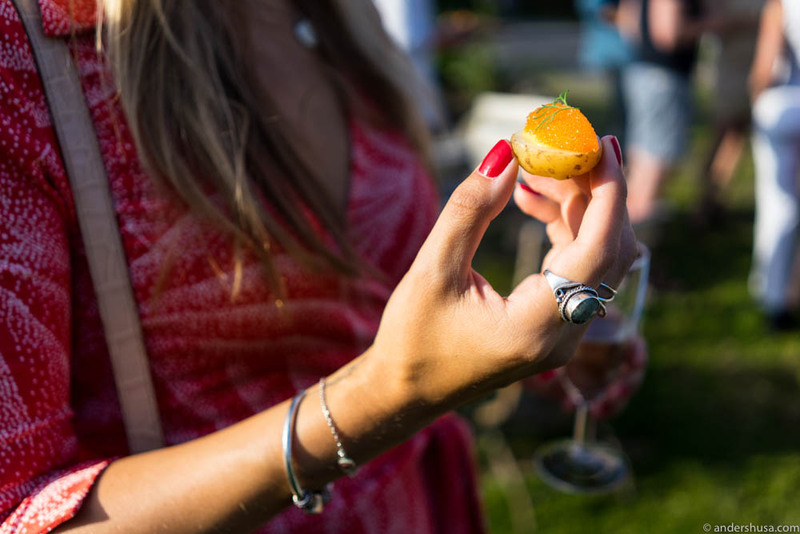 These orange berries, which we call Tindved in Norway, and Havtorn in Demark, adds an intense acidity and unique flavor. Furthermore, the wine pairing, a super crisp and fresh Grüner Veltliner, also helped lift the dish to a great start. My favorite dish of the meal was the poached wild halibut. It came with both fried (crunchy) and pickled (soft) rutabaga, incredible hazelnuts, fennel, and a sauce made in heaven. Sweet, caramelized, sticky, acidic, and velvety soft. “How did you make this?” I asked Linn. “The sauce is a mix of apple vinegar and local honey, which we reduce and mount with a ridiculous amount of tasty butter,” she explained. Ah, butter! How I love you … In the glass, we got a yellow-green white wine from the Loire Valley. “How many points did this one get in the newspaper? !” Linn yelled to Kim, who was busy in the kitchen. “What?! Oh. 95 points!” he replied before he went outside with two large sirloins of organic, grass-fed Aberdeen Angus beef from Horgen Gård. They were about to get a final caramelized crust over the fires of the garden pit grill behind the greenhouse. 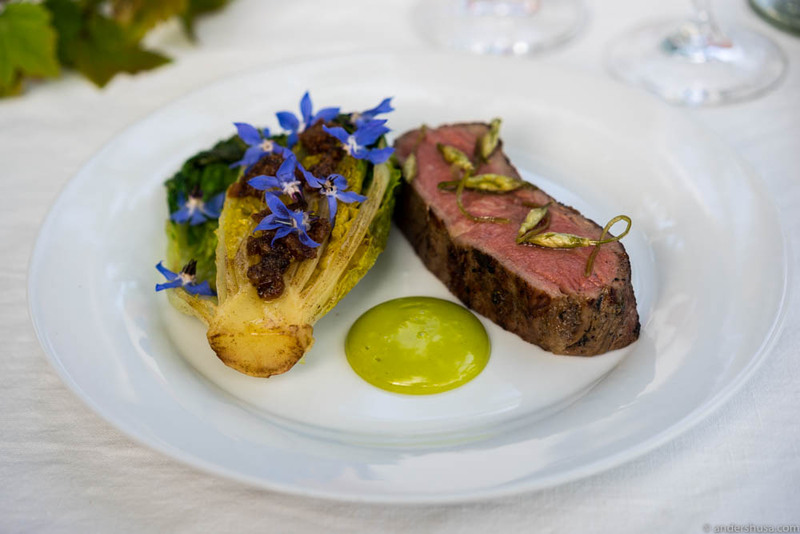 The tender, succulent piece of sirloin was served with a ramson emulsion, pickled and acidic ramson flowers, and a grilled little gem salad topped with crisped fat and starflowers. On the side, we got mini asparagus potatoes from Gyda Gård at Hommersåk in Sandnes. 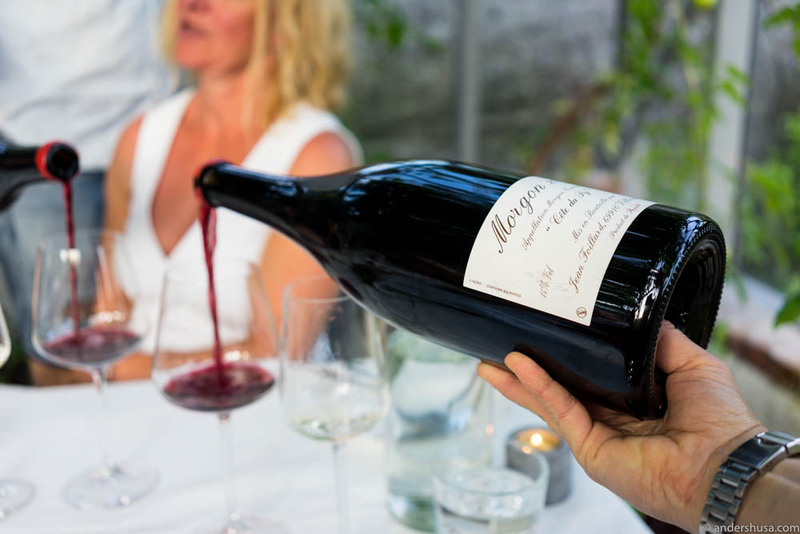 Since the Norwegian wine monopoly were all sold out of the wine pairing, the two Magnum bottles of Morgon (one of my go-to-wines at Territoriet) came from Kim and Linn’s private collection. I like their taste in wine. Another favorite producer of mine, Stephané Tissot, has a sherry-like, bright yellow white wine, which perfectly matched the cheese serving of 20 months old Comté (holy smokes, one of my most treasured cheeses as well!). I was lucky enough to eat at Måltid in Agder many years before they closed, although not under the leadership of Kim and Linn. At this point of the meal, though, it was not difficult to imagine that they ran a restaurant worthy of the French tire manufacturer’s approval. This was a Michelin-quality pop-up restaurant! How Did You Make That Cream? “How did you make that cream?” asked Øystein Gilje, who sat next to Hedda. He attended the pop-up together with his wife, Karianne Bjellås Gilje. You may remember her as the author of the book 100 Unique Experiences in Oslo, in which I contributed both text and pictures some years ago. 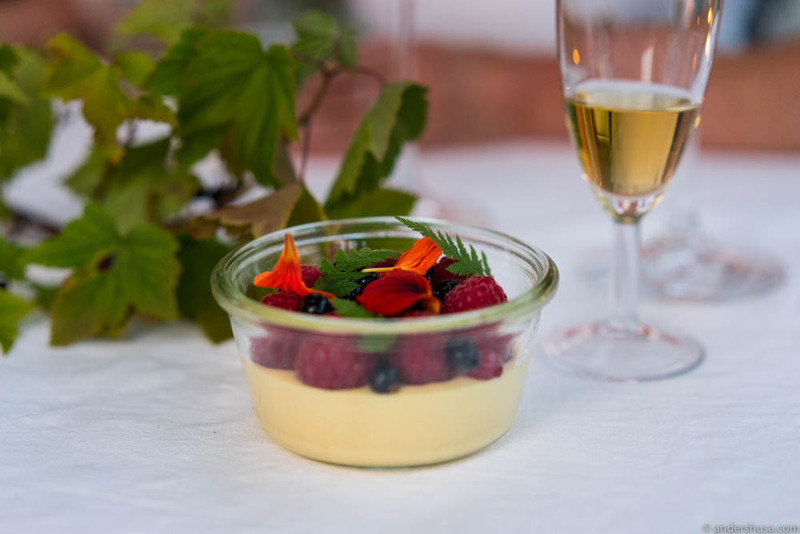 Linn told us the mousse was made with Amber from Summerbird, a super-tasty caramelized, white chocolate, which was mixed with Nýr – the sour fresh cheese from farmer Hans Arild Grøndahl at Grøndalen Gård. A combination that worked so incredibly well that it surprised me and many others around the table. 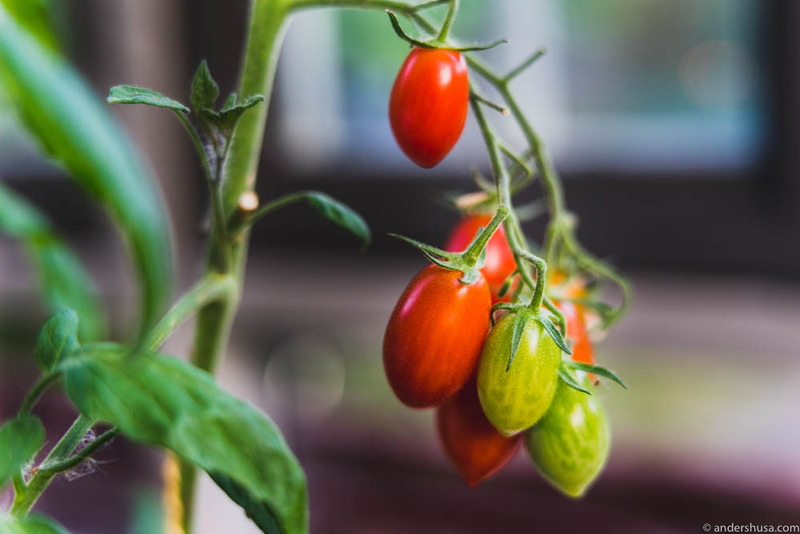 A deep, rich flavor, yet so light and fresh at the same time. Black berries from the garden, blueberries from Telemark, raspberries, sweet chervil and more nasturtium flowers on top. 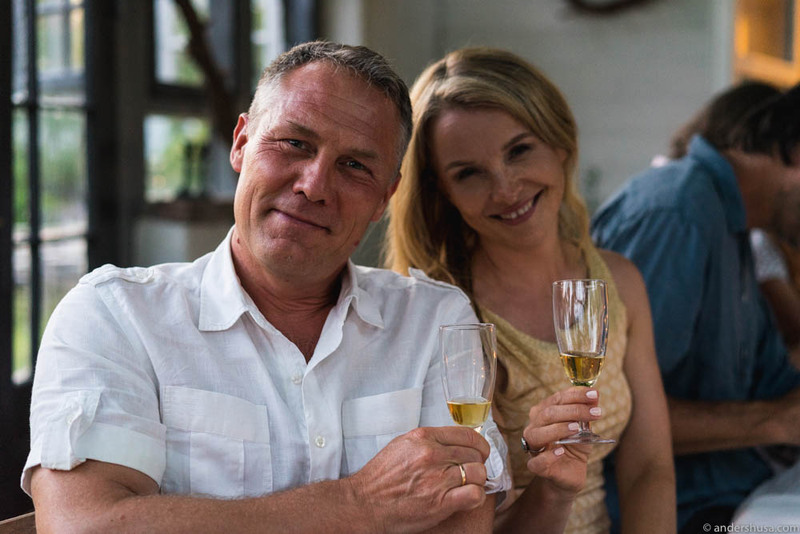 In the glass, a sweet Beerenauslese from Burgenland, which Linn served along with an excellent explanation of the different categories of Austrian sweet wines. We couldn’t wish for better food, more wonderful hosts, or a more amazing setting for a meal. If you can measure the success of a social dinner by the number of toasts, the volume of the laughter, and the number of moans, sighs, or screams of joy over the food, then this was a home run. What is the most beautiful setting where you ate a dinner? Please share your story in a comment below. This was a sponsored meal by Tjøme Kolonial. The company had no influence on the content of this article, and I received no monetary payment. Hi Rod. This isn’t my restaurant and, also, it was just a summer pop-up. I can’t think of anyone I know that runs a year-around glasshouse restaurant, unfortunately.